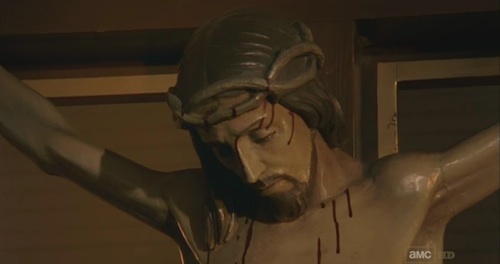 The zombie movie has always been among the bleakest and most spiritually hopeless of genres: I mean, once the dead start getting up and eating the living, what exactly is there left to pray for? At that point you pretty much have confirmation that there’s no order to the universe, no hope of Heaven, no vision of eternal life that doesn’t involve shambling and grunting and getting brain-lobes caught in your beard. Zombies mean chaos; zombies mean hopelessness; zombies mean Game Over. You may be alive now, but you’re outnumbered, you’re living in the final days, you’re running out of ammo, and you’re always one mistake away from being people-pâté. The best part? It’s only gonna get worse. I think this overwhelming sense of futility is one of the reasons—though there are others—that I’ve found myself feeling lukewarm about The Walking Dead. 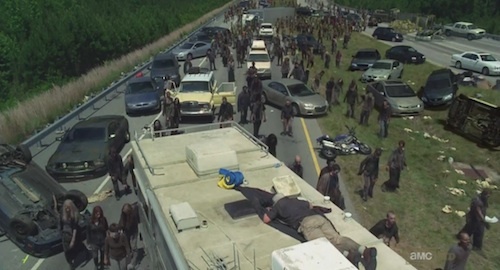 The show is well-made, and can deliver scenes of incredible tension and dread: this week’s opening 20 minutes—as the survivors cringe beneath cars on the highway while a “herd” of zombies pass by—is probably as nail-biting a sequence as the small screen can deliver. The Walking Dead had a strong (and short) first season, but—despite gripping scenes like this one—I have found it a hard show to invest in because I just don’t see where it can ultimately go. Zombies are a situation, not a plot; a world overrun by zombies is a setting, not a story. I mean, you can tell a story about survival, but that gets tiresome quickly: imagine if Jurassic Park were an ongoing series, with the characters just constantly running from dinosaurs without even having the option to escape the raptor-ridden island. (Oh, wait, you don’t have to.) The Walking Dead has state-of-the-art zombie effects, but by the second or third episode I was already tired of seeing the characters fight and escape the hordes. If you’ve seen one group of humans disguise themselves in human viscera to wander unmolested through a zombie mob, you’ve seen ’em all. What I do kind of like about The Walking Dead is its willingness to be so irredeemably bleak. “What Lies Ahead,” the first episode of the new season, certainly doesn’t do much to suggest the show’s worldview is going to get any cheerier. As the episode opens, we hear the voice of Rick Grimes (Andrew Lincoln) over scenes of desolation. “I guess I’m losing hope that you can hear me, but there’s always that chance, isn’t there?” Rick says. He is, we discover, sending a futile message out to Morgan, the man who saved his life way back in the series premiere—but the words carry an obvious suggestion of prayer, a lamentation to a God who seems to have all but abandoned the Earth. Rick, of course, also prays in the church—mostly out of desperation, admitting that he’s not much of a believer—and he asks for a sign, any sign, to give him hope. A few minutes later, in the episode’s final scene, he seems to get it, when a deer appears in the woods. 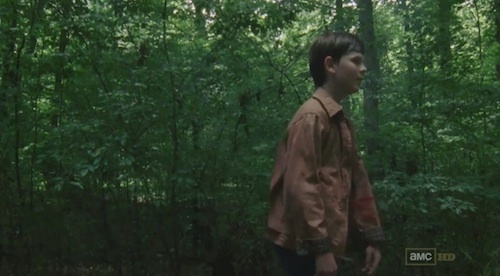 Here the show’s bleak sensibility shows itself most clearly: Rick, Shane, and Rick’s son Carl (Chandler Riggs) treat the deer’s appearance as a magical moment of pure happiness—which it is, right until the moment when a shot rings out and a bullet blasts through the deer and child both. I go back and forth on whether I really want The Walking Dead to introduce some kind of over-arching mythology—like Lost, for example—to keep me more interested. I think it would help make the show more than Zombie Escape of the Week, but I also recognize that it would be introducing a sense of narrative order—“There’s a purpose to it all!”—that might run counter to the honest, indifferent chaos that may the best thing the show has going for it. Maybe it doesn’t make sense; maybe there isn’t, and shouldn’t be, a meaning to it all. Maybe the lack of meaning is the meaning, and our only hope is to find purpose in existential survival. That’s an interesting notion, and unique on television: if The Walking Dead can find a way to make me care about its characters—and find a way to tell different, more complicated stories against this zombie-wasteland backdrop—this bleak philosophy could make it a show worth watching for more than its scares, fights, and undead vivisections. I’m willing to stick with it for now. See you next week. I couldn’t get past the biology.